Are you looking for the best posture corrector? If so, this buyer’s guide will help you find the best posture brace for your needs. We have listed the top rated posture braces and reviewed them in depth. On this page, you will find a summary of the braces. However, you can read more in-depth posture corrector reviews by clicking on the “review” button after each corrector. Below are the top rated posture correctors for both men and women. If you do not have time to go through this guide, check out the best posture brace chosen by our editors. Many people experience headaches, poor blood circulation, lower back pains and neck pains but do not think that bad posture may be their cause. How wrong they are! Today, most people sit in front of a computer all day at work. Majority of people do not take periodic breaks to stretch as recommended by doctors. There are various office chairs designed to help you get better posture. The chairs are ergonomic and provide some kind of lumbar support. The only problem with the chairs is that most of them only provide lower back support. You may be sitting on the best office chair but if your posture is poor due to slouching, your health will suffer. And this is where posture correctors or braces come in. What is a Posture Corrector Brace? Posture correctors are devices designed to help you achieve the proper posture when standing, sitting or walking. When worn over time, the devices automatically realign the shoulders, neck, back and spine to their correct posture. Posture aid devices are worn like vests up to your back to offer support and ensure you maintain the right posture. Having poor posture can affect your physical and mental health. On the other hand, having the proper posture improves your overall well-being and functioning of the nervous system. There are different types of posture braces in the market. For example, you will come across posture support braces for neck and back. How do you determine which is the best to buy? In the following posture brace review section, we look at some of the best devices in the market. The Bax-U is the best posture corrector on our list for a number of reasons. The posture aid device is subtle and hence can be worn during any occasion. Moreover, it is comfortable and approved for by Medicare for use in reducing back pain. This means the device may be covered by your insurance provider. The Bax-U was designed by a doctor who was looking to reduce kyphosis among her patients. 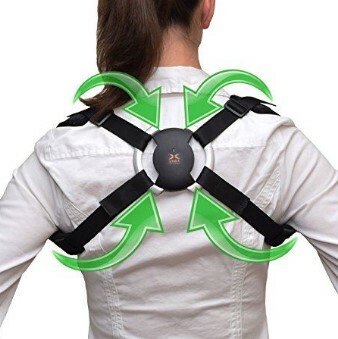 If you love technology, this the Smart back support brace you should get. This posture device is best for anyone who loves technology. The “smart” posture corrector is easy to set up. When you start wearing it, you will train your mind pretty fast to always maintain good posture. The brace has built-in posture support and is superior to other high-tech support posture correctors in the market. This is a simple, easy-to-wear posture corrector that will help ease back pain fast. The AlignMed Posture Shirt is one of the best posture aids in the market. Designed by a team of scientists and recommended by chiropractors, osteopaths, doctors and physiotherapists, the shirt I proven to help reduce lower back pain. Wearing the high quality product will help you maintain a good posture throughout the day. Its soft and breathable fabric is comfortable. The shirt is light and when you wear it, you will immediately notice a difference in your posture. This posture corrector is specifically designed to offer full-strength posture support. The Toros-Group back posture device stands out for its quality craftsmanship and this is attested to by its many positive reviews at Amazon. The brace’s straps do not become loose during the day to ensure you maintain the proper posture whenever you have worn it. However, the Toros-Group posture corrector pulls the shoulders back. Therefore, it is not recommended for daily use. The PostureNow Posture Strap is a corrector that features a low profile strap. The PostureNow Posture Strap can be used by men, women and children. The strap is best for a quick trip outside or if you want good posture when sitting in front of a computer. However, if you are looking for serious posture correction, we would not recommend this strap. One of the downsides we found with PostureNow is that when wearing the strap, one shoulder can be pulled back further than the other. Therefore, we recommend wearing the strap while checking yourself in a mirror to ensure the shoulders are aligned properly. We had no complaints about this corrector. However, from Amazon reviews, some people complained that the corrector is not strong enough to help someone maintain a good posture. The PostureMedic Plus Posture Corrector is an upgrade of the previous corrector produced by the company behind it. The new version is strong and easy to put on. We found the PostureMedic to be the ultimate low-profile posture aid. This FLA Orthopedics brace is one of the best posture correctors in the market. The posture brace is available in multiple sizes and colors. The FLA Orthopedics is one of the best posture correctors for women. The device’s shoulder straps hook to the support just below the breastplate. The corrector provides excellent back support to relieve pain. Make sure you measure your waist to avoid sizing problems with the corrector. Sitting or working in a single posture for a very long time can degrade your spine and lead to some injuries. You can prevent back pain and injuries by using some of the best posture belt braces in the market. There are posture correctors designed for men and those designed for women. There are also those designed to be used by both sexes i.e. unisex posture correctors. Generally, men posture correctors are larger and more rugged than those for women. The posture aids may also have a strap that crosses the chest. These posture correctors can be troublesome to wear for women. Women posture correctors are specially designed for the feminine body, especially around the chest area. Some female posture aids are made like a bra, are comfortable and easy for women to wear. Finally, you can buy unisex posture correctors. These correctors fit both men and women. Most people prefer to buy unisex posture correctors because they can share it with their spouses. My Pro Supports Clavicle Brace is the best men posture corrector in the market. The posture aid is designed by an orthopedist and is recommended by osteopaths, chiropractors, physiotherapists and doctors. The posture brace is made from breathable materials that are soft to the touch. You can also wear it under your clothing to engage in any activity. The Bax-U Posture Back is the best posture brace for women. The brace is designed by a US chiropractor and is 100% approved by Medicare. The Bax-U is subtle and hence can be worn under your clothing, even when it’s hot outside. The posture brace comes in different sizes to fit different bodies. You can either buy a white or black Bax-U posture corrector. There are various benefits of using posture correctors. Most people know that the correctors help to alleviate back pain or improve posture. Here are some more benefits you may not be aware of. The best posture correctors are designed to re-align the spine to improve your posture. People who work in the office seated on a chair the whole day usually have problems with their posture. Wearing a back posture brace will ensure your spine is in the correct position. Posture correctors get rid of pressure on various parts of your body, including upper back area, shoulder area, neck and knees. Wearing a brace also helps to relieve chronic fatigue problems by making you more active. You can improve your productivity at work by wearing a posture aid. A posture brace will train your body to be in the correct position all the time, making you more productive. Back braces help to prevent fractures, injuries, sprains and other health problems. Wearing the braces can also help to eliminate back, shoulder and neck pain. You will look good when standing or seated in the correct posture. A posture corrector will ensure you stand in the correct posture, making you appear taller and slimmer. Wearing back posture braces regularly enhances your brain power and improves your mood and concentration. The braces eliminate various health problems associated with the spine, making you healthier and happier. The best posture braces are light in weight and can be worn under the clothes. The brace are also washable and can be worn when sitting, standing, or walking. If you have mild back pain, you can get relief by using the best posture corrector. Read posture corrector reviews to know which aid to go with. If you have severe back pain or spinal problems, get in touch with your therapist for advice on the best posture back brace to buy. This also applies if you are looking for posture correctors for seniors. Next article Bax-U Posture Corrector Review – Does it Really Work?